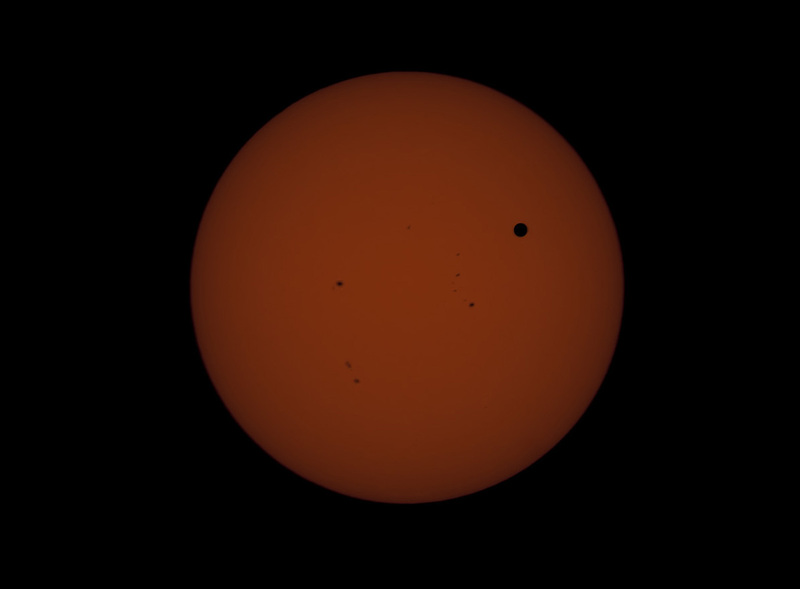 Venus passed between us and the Sun at inferior conjunction on June 8, 2004, for the first time since 1882. I had to travel to the other side of the planet in order to see the 2004 transit of Venus. I saw the 2004 transit from Mauritius Island in the Indian Ocean. Venus orbits the Sun 13 times in a little short of the time that it takes for Earth to make 8 orbits, and in order to see a transit, inferior conjunction must coincide with Venus passing its descending node (or its ascending node). Because the path of Venus from our point of view moves 20 arc-minutes further north on the face of the Sun on each of these 8-year anniversaries, when we see a transit of Venus as we did in 2004, we usually see a second transit of Venus 8 years later; (the only time we do not get a pair of transits 8 years apart is when the first transit passes across the Sun dead center). Fortunately, the transit of Venus in 2012 was visible from the western hemisphere, and I was able to watch it from my home in Scottsdale, Arizona. This image was taken with a Canon EOS Digital Rebel SLR camera on a Takahashi FCT-150 refractor at prime focus using a Thousand Oaks Optical Type 2+ solar filter. This image was taken from my backyard in Scottsdale, Arizona. The telescope was carried on a Takahashi NJP mount converted to a Temma mount. This image was published on the Spaceweather.com website.